A versatile artist who goes down in the Taiwan art history. Liao Shiou-Ping’s artistic path started with oil painting and then extended to the field of prints. 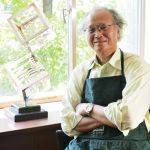 His prints were mostly based on oriental traditional symbols, from the pattern of Chinese Ritual bronze, the "Temple gate series" to recent series "daily utensils". His artistic style evolved according to his own experience and reflections from daily life. He picked up inspirations from the motherlands and absorbed aesthetic elements from everyday life. Based on the traditional materials and techniques of prints, Liao Shiou-Ping brought the skill of etching and screen printing back to Taiwan from France and United States. He dared to use different materials, and combined oriental aesthetics with modern art, developed an innovative vision of print-making. Thus, he is considered as Taiwan’s “Father of modern print-making”.